Saturdays were the worst. Mondays were the best. And this is a great, really great little book about teenage love in the 80s, between Eleanor, the weird new girl at school and Park, the geeky, cool biracial kid around the block (However, ethnicity commentary is clearly not the author’s forte). Rainbow Rowell's story is heartwarming, charming and wonderfully paced and the main characters read like real teenagers for a change (I didn't believe A Fault In Our Stars. Sue me). The pop culture references aren't always convincing, but the progressive bonding of the two kids over comic books and 80s music is and I think this is a lot more important. 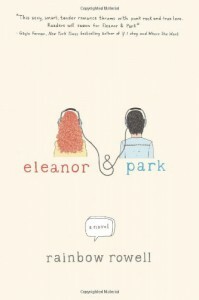 Sweet, romantic, hopeful and full of teenage awkwardness, Eleanor & Park made me think of my first crush in high school and also wish there are lots of guys like Park and even more girls like Eleanor out there today. That's not a little thing at all.